Sweet potato is such a popular food at the moment. It’s nutritious and easy to prepare, which makes it a real winner in so many healthy recipes. This salad is a great way to fill you up while providing protein and antioxidants. 2. Place the chicken breasts in a baking dish. Brush with the olive oil and scatter over the chilli, paprika and a pinch of salt and pepper. Bake in the oven for about 20 minutes, until the chicken is completely cooked through. When it’s cool enough to handle, cut into bite-sized pieces. 3. Meanwhile, steam the sweet potatoes for about 15 minutes, until tender. Remove the potatoes from the steamer and let them cool down to room temperature, then cut into bite-sized pieces. 4. Whisk all the dressing ingredients together in a small bowl and season with a pinch of salt and pepper (or any other spices that you like). 5. 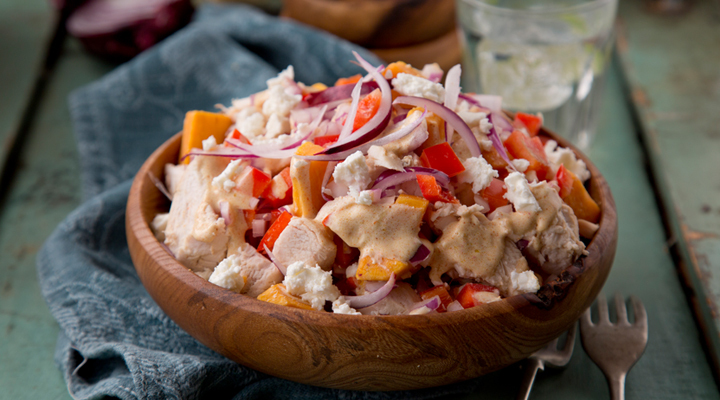 Place the chicken, sweet potato, onion, red pepper and feta in a large bowl and drizzle the dressing on top. Gently mix everything together using a large wooden spoon. Serve warm or cold. Tip: To cool the sweet potatoes faster, just stick them in the fridge or freezer for 15 minutes.